2014 Topps Turkey Red is back. And, once again, it's an online-only product. Boxes include ten base cards and one autograph. The 100-card base set will features a variety of players from each team, and two rookie players, Travis d'Arnarud and Xander Bogaerts. Printing Plates are the only parallels. Each box contains one autograph and the autograph checklist includes 34 cards, with players like Buster Posey, Michael Wacha, and David Ortiz. 34 cards. Cards numbered to varying amounts. Print runs noted where known. 3- 2014 CHRIS OWINGS TOPPS Turkey Red AUTO Ltd & #'d 599 Get It Now GREAT!! Good: Intrigue of an online-only product, base card backs look solid, great for through-the-mail autographs. Bad: Top autographs near-impossible to get, sticker autographs, bland. The Bottom Line: The big draw of 2014 Topps Turkey Red Baseball is the intrigue of it originating as an online only product. There’s a feeling of exclusivity that comes with it. And while the $20 price tag is necessarily high for a pack that guarantees an autograph, the fact that most of the good ones are extremely tough to find (and that might be an understatement) should significantly lessen expectations. The cards are solid, though they are quite a bit different that past Turkey Red sets. 2014 Topps Turkey Red Baseball sticks with the old-time motif, which is important given its roots in the tobacco era. However, it’s also very bland. 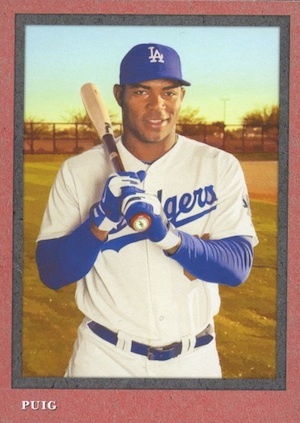 I like the matte finish, but it doesn’t compare with the textured feel Topps has used for it in the past. The dark borders are distinct, but the other design elements are very simplistic. Add in some recycled images and you’ve got something that’s okay but far from spectacular. The elegance of the backs are my favorite part of the design. The balance of text and white space is nice. There’s also continuity with past designs. The matte finish is perfect for autographs. Unfortunately, it’s stickers. Little changes from the base design other than the numbering and a little autograph note. At 100 cards, the base set is about where I think it should be. While not big, it covers baseball’s big names. As an online-exclusive, it’s doubtful many collectors are going to want to splurge on a ton of boxes. So this keeps the base set challenging while still being attainable. Where things fall apart is with the autographs. The checklist has very few main-attraction players to begin with. And besides maybe Michael Wacha, all are extremely short printed, especially when you place them alongside the more common cards. While it’d be unfair to expect superstars at every turn for a product at this price, I think 2014 Topps Turkey Red Baseball would actually be stronger without base autographs that are numbered to 5 while others have as many as 699. The initial $20 asking price for a single-pack box doesn’t seem unreasonable. However, when you take into account that you’re about 99.9% certain of getting an autograph from a player who will likely make little to no impact in the game, it seems a lot more pricey. The base cards are moderately limited, which helps a little but they don't carry much pizzazz to them. It would have been nice if there was something a little extra, similar to the mini parallels that Turkey Red Football has used. Or possibly an insert of some sort other than Printing Plates. Really anything to take the heat of the autographs, because that’s where the majority of the value in this product lies. The simplicity of 2014 Topps Turkey Red Baseball’s configuration is refreshing. The exclusivity is intriguing. However, the end result is plain and the lack of quality autographs is frustrating. Is this a worthy speculator target? Or another 2013 Heritage update bullocks? Checklist looks like a less than impressive lineup. why do the rookies not have the “RC” tag on them? emeekins � d’Arnaud and Bogaerts are the only rookies in the set, I believe (I haven’t scoured it all top to bottom) and both are noted. Just pulled a Zoilo Almonte black border 1/1 auto, can’t find any info on these.